Introduction: Why Do We Raise Animals for Food and Products? Part 1: Why Do We Raise Animals For Food and Products? Why do we use livestock products for human use and consumption? Should I feel bad when I eat meat because an animal died to become that meat? Why can’t animals be set free to live as long of a life as possible? But do we really need animal agriculture? Must innocent animals lose their lives for human benefit? Why can’t we just rely on fruits, veggies, and grains to feed and clothe the masses? Here are 10 reasons why animal agriculture exists and why it is ethical. The fact that humans eat and use animal products is the main reason most livestock animals are alive in the first place, even though in certain cases the process theoretically ends their lives as well. If you believe animals like cows, pigs, chickens, or sheep deserve a chance at life, you must believe in the use of animals for humans, because without us, 95% of these animals would never be born in the first place. Farmers help bring these animals into this world and give their lives meaning and purpose as they leave it (food and products). The only question that remains is whether or not the quality of life for these animals is worth them being born in the first place, which will be addressed in the subsequent “animal welfare” blogs found on the home page of our blog. Meat, milk, eggs, and thousands of other food products come from animals. Animal products are found in a vast amount of foods consumed today. Furthermore, animal by-products are used extensively in almost every walk of life. While you may be able to avoid eating animal products, it is nearly impossible to avoid using animal by-products. The infrastructure of the livestock industry has allowed for thousands of these products to be made affordably, efficiently, and sustainably. If we did away with livestock products, we would have to reinvent the infrastructure of our food supply and product supply, which would prove to be extremely costly. Thousands of farmers would have their current farming methods they have developed over centuries taken from them. Technology is what has allowed 1 farmer to feed 155 people today instead of 27 people in 1950. Livestock technology is a huge part of that. If we were to abandon animal agriculture, we would see a drastic decrease in food production and an drastic increase in food prices. This would be taking us in the opposite direction of producing enough food to feed a growing population. Millions of acres of land are not suitable for crop production (due to slope of terrain, soil type, rainfall, etc.) and are therefore grazed by livestock animals. In fact over 13 million square miles are grazed by livestock animals around the world. These animals help maintain the ecosystem of these grass acres and convert the grass into food for humans. If we took those livestock animals away, the millions of acres of grassland would become unproductive instead of providing billions of pounds of food each year. If our goal is to feed 9 billion people by 2050, this would be a huge step backward in reaching that goal. Currently there are over 11 billion birds, 87 million cattle, 67 million pigs, and 5 million sheep used in U.S. livestock production today. Farmers breed these animals, feed these animals, and protect these animals. They are domesticated. If livestock production ceased, the incentive for farmers to spend their lives caring for these animals would be gone. Farmers would no longer be there to take care of these animals, they would no longer be maintaining fences, caring for the sick, protecting them from predators, etc. Animals would either die out, live in the wild, or live in a zoo. 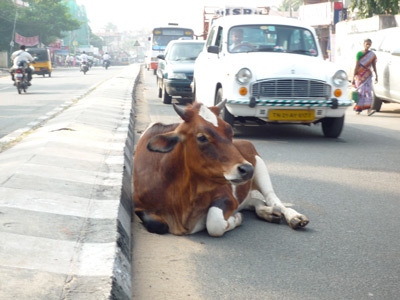 In the wild, livestock animals would no longer be producing food, products, and labor for humans, they would become road hazards and would get into yards, gardens, and public places. They would be a nuisance. The reason these domesticated animals have survived over the generations is based on their importance to humans. Even if sanctuaries were built for large numbers of animals, only a small percentage of the amount we have today would exist. Without fertilizer, farmers of all types could not grow half as much food as they do. While there are synthetic fertilizers available for farmers to use, many farmers, especially organic farmers, rely on manure from animals to fertilize their crops. Putting nutrients back into the soil through spreading of manure is one of the most natural ways to grow food without depleting the soil and the environment! While it is entirely possible to consume a diet free of livestock products, it can be quite difficult. Many people in this world do not have the extra money, time, or discipline to spend avoiding products from animals. Meat, dairy and eggs contain essential nutrients such as protein, calcium, potassium, B vitamins (niacin, thiamin, riboflavin, and B6), vitamin E, iron, zinc and magnesium. Again, the infrastructure of livestock production has allowed for these products to be low in cost and easily accessed. If animal agriculture did not exist, millions of people would have to find a job doing something else. This includes jobs in animal production, processing, sales, nutrition, and health. As many know, finding a job can be a struggle no matter what industry you are a part of. 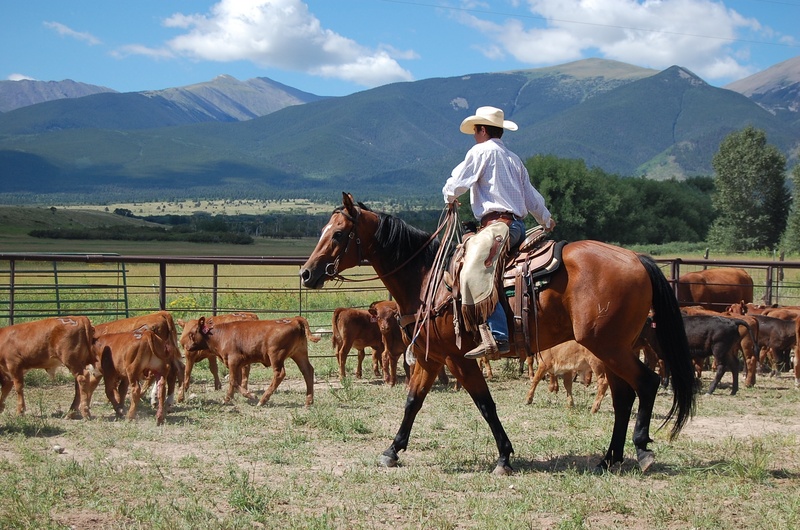 Livestock farmers and ranchers have developed and passed down skills and talents over hundreds of years learning how to take care of livestock animals. 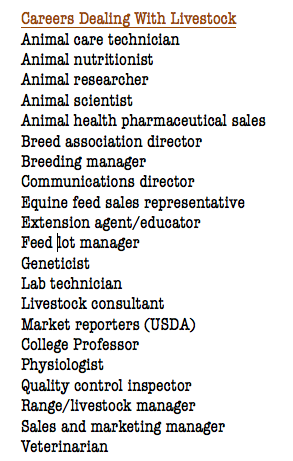 Colleges and universities around the world have trained thousands of people in different areas of livestock production (see below). Abandoning all of that would be a waste of time and resources and would leave many searching for a job, possessing skills that are no longer needed. Many countries are struggling economically, but agriculture is usually one of the bright spots in an economy. If animal agriculture were removed from the economy of a country like the U.S., it would be devastating. Hundreds of thousands of farm families around the world rely on livestock animals for their survival. There are places where livestock animals are the only thing a family owns besides their home. In wealthier societies, we do have a choice of whether or not to eat meat, but in many places that is not an available choice. 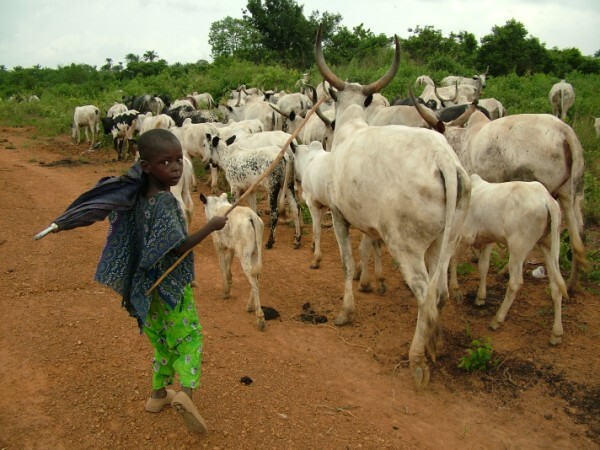 Even in wealthy countries, livestock animals can provide the majority of a farm family’s income due to location (surrounded by pastureland), amount of land owned (not enough to make a living on crops), and climate (grow crops in the summer, livestock in the winter). Families could relocate and adapt to make a living apart from animal agriculture, but it would be unfair and extremely costly to them. Although tastes and preferences vary tremendously throughout society, most people would agree that the best tasting foods involve animal products! 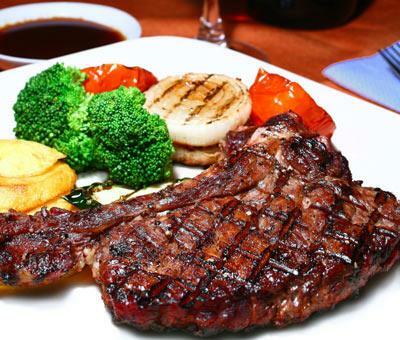 A world without burgers, steaks, eggs, milk, and ice cream would be a sad scenario. Bottom line: You can choose to avoid animal products for a variety of reasons. You can work to improve animal welfare. 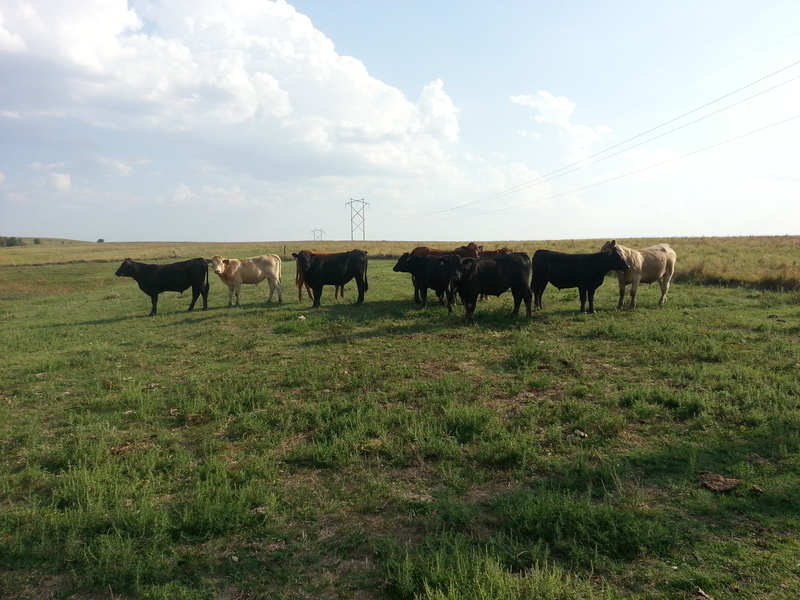 And you can continue to ask questions to help keep livestock farmers and ranchers in check. However, the practice of animal agriculture is a very important part of society and the people who are involved in the industry should be supported when they are doing a good job. To see what the current state of the livestock industry looks like, please read the rest of our blogs detailing the life cycles and welfare of different livestock animals. And please, feel free to leave questions at the bottom of this page! This entry was posted in Uncategorized and tagged Agriculture, animal abuse, Animal Welfare, beef, cattle, circle of life, dairy, eating meat is good, Farming, meat is murder, meat is not murder, Peterson Farm Bros, Peterson Farm Brothers, pork, should i feel bad when i eat meat, vegan, vegans are bad, vegetarian, why do we raise animals for food, why not be vegan, why should i eat meat by Greg Peterson. Bookmark the permalink. Studies consistently show that we can produce calories more efficiently from plants directly, rather than through breeding and killing animals. The UN, the Worldwatch Institute, and other government and nonprofit organizations (not animal rights groups) are urging us to reduce our consumption of animal products. You should feel bad that you needlessly killed an animal – probably when quite young. They can. Wild animals are free. For domesticated animals, they live long lives and die of old age on sanctuaries. No they wouldn’t. In fact the opposite is true. Because producing plant-based calories is so much more efficient, we need less land compared to raising and killing animals to eat. As the country transitions to a more plant-centered diet – already underway – some of the land currently used for feedcrops and grazing can revert to wilderness – the most efficient use of land – and wildlife would have a chance to rebound. Agreed. And factory farms are hellish and inevitable at current demand. So let’s stop the whole bloody, wasteful business. No they don’t. They destroy them. Animals want to live, explore, make friends, raise their young, enjoy tasty food, and have fun. They’ve done that for eons without us “helping” them by castrating them without painkillers and mass-slaughtering them with bolt guns at a fraction of their lifespans. Animals also don’t want to be bred to grossly overproduce flesh, milk, or eggs. That’s not giving them purpose; that’s giving them pain, suffering, and death. Our purpose, on the other hand, is to be compassionate, respectful, and kind; to promote happiness and refrain from inflicting avoidable harm – and that means not eating animals if we don’t have to – and probably almost no one who will ever read this blog has to. Gary, thanks for the comment! -I would encourage you to post those specific studies so I can review them. -Livestock animals are not “needlessly killed,” they provide food, fiber, products labor, etc. to millions of people. The 3-6 million pets who are euthanized each year are needlessly killed. The 21,000 people who die each day from hunger are dying needlessly. -Domesticated can live and do live in animal sanctuaries for many years. But that can only represent about 5% or less of the livestock animal population. The rest would never be born in the first place if not for farmers. The lives they live on farms are very enjoyable, despite what you may believe. Have you visited livestock farms before? -I never said that vegan lifestyles weren’t possible or healthy. I have no problem with anyone eating vegan. However, we should have the freedom to choose otherwise! -Research is clear that meat consumed in the correct portions (Americans eat too much of it) is very healthy for humans to consume. Again, please post the specific studies that say otherwise. 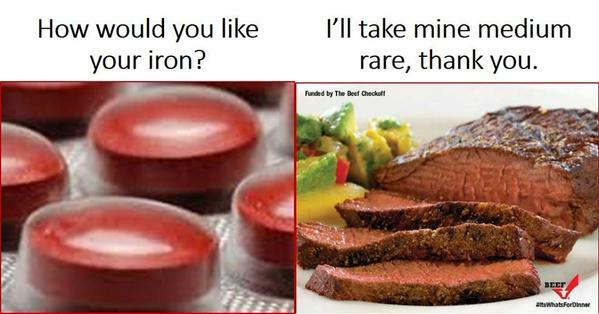 I know lots of people who have consumed meat their whole lives and lived to be 90 or 100…. -No. You can’t grow plants or crops on ground that is not suited for plant or crop production. Plant/crop production requires good soil, plentiful water, flat slopes, etc. Producing plant-based calories is more efficient in good conditions, but in these semi-arid places where most cattle are turning unproductive land into food, it is absolutely more efficient to raise livestock. -Have you ever been to a “factory farm.” Ever observed one up close? Ever met the farmers operating them? Don’t base your opinion on such a vague term from reading and watching things on the Internet. My family’s farm meets the factory farm “definition” (over 1,000 head) and we host tours every summer! -The livestock industry is not wasteful. Did you observe the thousands of products that come from livestock in the blog? Nearly every part of the animals are used for something beneficial to the human population. Plus, their waste is used to fertilize most of the crop/plant acres in production. Where is all of that fertilizer going to come from without animals? -Animals live, explore, make friends, raise their young, enjoy tasty food, and have fun on livestock farms. I can personally vouch for this statement based on the farms I have visited. Livestock farms absolutely do not take these things away! -How do you know they don’t want to be bred to produce food for humans? It is a noble purpose and is the only purpose I can see them having. Animals living in sanctuaries do not have purpose, they enjoy being alive for the sake of being alive. Animals in sanctuaries enjoy life. Animals on farms enjoy life. The only difference is the latter produces billions of pounds of food and products that benefit humans! -“Our purpose, on the other hand, is to be compassionate, respectful, and kind; to promote happiness and refrain from inflicting avoidable harm” EXACTLY! We agree on this statement 100%! This is the mantra livestock farmers live by. 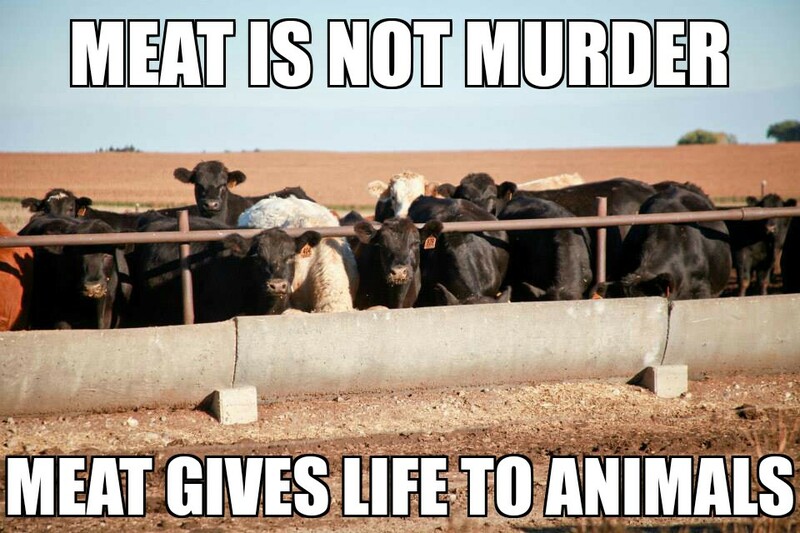 However, eating them at the end of their lives is not harming them or inflicting pain, it provides them with life and gives purpose to their death. I look forward to your response, thanks! Over half the planet is starving, and they will eat anything up to and including each other to stay alive. Eating plants excusively is a snotty faced white lie from privileged kids who have no idea what it is like to be hungry enough eat a termite, a cat, or a cow. If you have ever gone hungry, really hungry, you will know that quinoa won’t cut it. A reasonable amount of animal protein can make the difference between basic survival and malnutrition. We are wise to remember that those $1 burgers are a blessing that are keepng some people alive. The planet is not starving because there is not enough. The planet is starving because the prices are not mandated by “fairness” but because of “demand”. There are super-healthy products that grow easily, e.g. hemp, and should be the cheapest thing ever, yet it’s ridiculously expensive. In the event of some day being enough food there to feed everyone, that food would be DESTROYED or the price raised, so again, people keep producing more to afford it. I saw it happening in a produce market at the end of the day in a weekend: The farmers throw the unsold produce to the garbage, so the market price doesn’t drop. Also, most of your facts are taken from government propaganda, which are never the best for people, but for industries (e.g. “a reasonable amount of animal can make the difference…”. It’s known you can be well nurtured with plant-based foods, but they just happen NOT to be published nor sponsored to be produced or recommended, AND people have been shown not to starve if fed medicinal doses of sea water. Yes, they just stopped dying just because of free abundant sea water… and they’d stay alive healthier than if suddenly fed meat. We have enough food to feed 70 billion non human animals every year. If we didn’t have to feed them, we could easily feed the 7.5 billion human animals. These three brothers are doing some amazing things in telling our story to the world. Not only are they sincere, honest, hard working farmers, they also speak the truth and have done a lot of research into their topics. Thank you for promoting American agriculture and farmers. I agree with your view. I think that biology, human culture and the freedom of men also are part of these discussion. In human history meat is a daily ingredient in al cultures. In biology there is a division in herbivores, omnivores and carnivores. The difference between these can be derived from the teeth and the digestive system. Humans have teeth and a digestive system that cataloge them with the omnivores. We are made to eat meat but also vegetables. We have given the earth (if you believe in God, we recieved it from Him) to leave on and we use it to make our lives as comfortable as possible. We use water, air, soil, place, metals, vegetables animals. When we use the earth we must respect it, in every way possible to give it to our children. So we must also respect the animals that we use in daily live. I now from my experience that most farmers care their lifestock with more love and respect for the animal nature than many people with a pet. They do their best but often dont understand the animal nature by lack of knowledge. In nature only that animals lives that survives the law of the jungle and has luck. Most farmers care for their animals and help them when they are ill, or be disowned by other animals. What people eat is something that must not be regulative when their is no disadvantage for other men. Many people still dying by shortage of food. In these parts of the world with good infrastructure and use of technology there are no shortages of food. Technology gives us the tools to feed everyone. That people are starving to death has more to do with politics (and mostly localy) than with what we eat. Hereby i tried to give my view in connection whit what you wrote. Excuse me when there are grammar ore other errors in my text, but English is not my my mother tongue. Although I am for consuming animal products, Human teeth would be classified as herbivore, not omnivore. Compare human teeth to those of a bear, which is an omnivorous animal. A bear has large teeth that resemble a tiger/lions teeth made for ripping apart muscle tissue but a bear also eats plants, fruits, and seeds. Human teeth are rounded and our canines are no where near the sharpness and length of a bears. Thus, you can see that humans are in fact made as herbivores and not as omnivores. You seem like nice guys! While I don’t totally disagree with your post, I don’t totally agree either. My problem is with the horrible treatment of livestock animals. Horrible. Treatment. Sounds like you run an upstanding operation, but for every one of guys like you there’s an equal and opposite livestock producer or slaughterhouse owner who seems to have no soul and treats the animals in his/her care with no compassion for what they are—living, breathing animals that deserve a decent life and a swift, humane death. I personally don’t eat meat and consume very little dairy, mostly from farms where I know the animals are treated well. I wouldn’t eat my pig any sooner than I would eat my dog. I have friends who go to church, contribute to environmental causes, make sure the schools in their neighborhood are good for all the kids and then sit down for dinner and eat a chicken or a pig that was surely tortured for its entire life. That’s just plain wrong. It’s your profession, not mine. I think it’s time for the good livestock producers in this country make sure the bad ones get put out of business. Because until then, I can’t support the industry, not one bit. I firmly believe that 99% of livestock animals are not “tortured” or treated “horribly.” I have visited hundreds of livestock farms of all types, including several “factory” farms, housing 10,000 animals. While conditions are less ideal at these farms, there is no “torture” of animals happening. How many farms have you been to that torture their animals? Where are they? I’ve been around farming all my life, and have been to hundreds and hundreds of livestock operations. I’ve met one person who mistreats their animals. Nobody likes them, but they exist, but you cannot judge an industry by an extreme few bad apples that get youtube videos put on the net. Slowly they are driving themselves out of business because the livestock don’t do well in this environment, and others in the community don’t wish to do business with them, and their reputation of poor animals precedes them wherever they go. The hundreds and hundreds of other farmers/ranchers/cattlemen will do anything to keep their animals healthy and happy. They are hardworking, and upstanding citizens. They are visibly shaken when they lose an animal, and do everything and bust their butts day in and day out to keep their herd healthy. During calving season for cow calf operations, they brave blizzards, late nights, early mornings, making sure each calf is born without complication. They chip ice in the winter so they have water, and they feed, and feed, and feed, and feed, and basically provide for every need of their domesticated animal. Not only do they treat their animals well because they are good human beings, but they do so because a happy animal gains more weight on less feed than a stressed one. Animals do not think like humans, they don’t dread the day they die. They don’t see it coming in the future and worry about it. The fact that they live a shorter life isn’t morally wrong……do you think they would have rather not lived at all?..because as this article astutely points out they wouldn’t exist without their purpose. Please go visit the Petersons or literally any other farmer close to you who runs a big operation and will allow it….see the livestock with your own eyes! Quite frankly, livestock animals live an easy life compared to wild animals. I’ve seen starving deer, I’ve seen mangy coyotes freezing in the winter. I’ve seen injured deer eaten alive by predators. Sure they get to live longer, but it seems that wild animals live a much harder and stressed out life than livestock animals. Of course, they are happy for the opportunity to live as well. Would anyone buy wilted lettuce from the grocery store? Would you buy broken chicken wings for your hot wing dinner? Did you pick out the friendly healthy puppy for your family or the one that growled and snapped at you? How many times do you buy a brand of tennis shoes that wear out in a month, or that shirt that the stitching came out in the washing machine? Do you as a consumer continue to purchase bad tasting food or shoes that don’t last? Ag production works the same way. Farming is a business. If a business doesn’t produce a good product, then the business doesn’t thrive. The farmer is paid accordingly to the quality of their product. The real deal in the” oh so famous animal torture videos” the animal being sent to ‘market’ in that condition actually lost the producer money and if the animals arrive in bad condition too many times, the producer actually looses that outlet to sell their product. Happy, healthy animals eat and drink which makes them grow big enough to go to market quicker. Meaning a paycheck sooner rather than later. If the animals are sick or stressed, they loose their appetite just like humans do and don’t provide an efficient income. As an individual, we cannot control the lying, cheating and stealing of others, farmers cannot control how another farm is managed. But bad management does show up in the end product and profit margin of all business. This has happened with hogs in the recent past. When the pork price became lower than the cost of production some people released their pigs. Then the ones that survived became feral hogs that roam around tearing up crop land. So let me get this straight: because you run an apparently legit farm operation, you want us to assume that that is the case for every animal farm on earth? Because it most certainly is not. How can you say raising animals in cages for meat, dairy and eggs gives them purpose and life? And they should be glad or what? Isn t the bulk of your industry the big monsanto type corporations breeding and killing animals like it’s nothing? There’s this ‘theory’ saying animals are not anyones property and they’re not. They are sentienent beings and all sentient beings should be free. That we put prices on their, and our, heads and treat them horribly just so afterwards we would also profit financially is an anomaly that should stop asap. Just because one bad video from one farm gets shared does not mean every single farm is like that Its like saying parents don’t love there children just because that lady three states away raised her child in a cage. You think that a farmer has 1,000 animals in their back yard and never affectionately pets them or gives them cookies every once in a while. Of course they love these animals, they become apart of our families, and they get slaughtered. It does not mean we stop loving but also have a respect for them that is some much different then anything else. We walk beside these animals, they are not just for profit, they give farmers lives meaning and a purpose. If this was just for money I think farming would have ended a long time ago, the investment is bigger then the profit but for the people who love these animals and live for these animals it is worth it. These animals are cared for it might not be the way you would consider your average cat or dog to be cared for. But they are, they are pampered more the a person could understand, but you would not know that if you have never truly visited a farm like these boys have. Which means you should be slaughtering your human family, to be fair. No…..humans and animals are not the same. Many vegans believe this and that is the foundation for why you believe what you believe. But it is just not true! Fussy eaters should Starve…many people in the world live in poverty and go hungry. I think it’s okay to kill old age farm animals e.g sheep for food because they nearing death anyway. Farm animals provide us with a whole lot of benefits so why is it wrong to eat meat/meat products? Vegans are asses! 1. No animal of any age wants to be killed, which means to do it merely for the pleasure of your taste buds is immoral. The same goes for fashion sense, entertainment, and any other non-survival reason. 2. 99.9% of animals we exploit for “food” are killed when they’re still babies. Over 58 billion land animals and many hundreds of billions of sea animals. Animals are not aware of themselves being killed, unless you do it slowly, which does not happen in today’s modern slaughtering process. Besides, they would not be alive in the first place if not being raised for food. They are not being killed merely for taste or entertainment. They are killed so they get the chance to live in the first place, and in the process become food and products for humans. Greg, I’m trying to understand your stance. — This sentence implies that the main purpose of breeding them is to raise them for food. — This sentence implies that the main purpose they are raised is because humans want to give them a chance to live. This is contrary to the earlier sentence where the main purpose is to raise them for food. It is either a dissonance, or the statement has to be refined for clarity. Also, 13,000,000 square miles grazed by livestock? That’s over 8 billion acres. That’s roughly 25% of the world’s land. That sounds unbelievable. Source? This is a great blog that presents some important points about contemporary agriculture. I grew up on a small beef-producing farm (70 head) and then headed into academia in engineering and the liberal arts. I am politically liberal and live in very liberal city. That said, I am stunned at how ill informed many well meaning liberals are related to where their food comes from and the viable options that exist to provide 1st world people with reasonable choice and quality for their dietary desires. While I agree with the majority of what I’ve read here, what makes this site fantastic is the way you provide clear writing which is well researched and thoughtful. Furthermore, your interaction with hostile posters is quite marvelous. Keep up the good work.